At the end of the previous installment, KH, there was a secret movie that was to bring light on what the sequels could be like. When you made those sequences, did you already have in mind what CoM and KHII would be like? Nomura: In a kind of vague way, yes. The most precise visions I had were those of KHII as I already had decided that it would take place a year after KH, that the atmosphere would be different in some ways. If I was to create a KHII, I wanted it to begin in the most intriguing way as it would be possible. I only began thinking about “What happens in that year between” in CoM much later. When we look at the project book, we can see that KH: CoM was originally called “KH: Lost Memories”. Nomura: Though for some (reasons) we had to change the title you’ll notice it isn’t that much different than the orignal.. I though that “Chain of Memories” had more style and it matched the general outline of the story too (i.e. Sora relieving a sucession of memories, a chain) and I personally liked it. What was the reason you decided to develop this installment for the GBA? Nomura: Soon after the release of the previous installment, I was told that I should make a KH for GBA. But at the time I was skeptical of the idea of seeing KH in 2D and said “Can’t do it”. Then as I began to think about what I could work on next, I began to hear (people say) “Our kid wants to play KH on GBA” alot more frequently. That kind of a real voice that was saying that “Kids want to play” got me seriously considering it. So it was the voices of the children that moved you? Nomura: Yes. That is when I began to elaborate a gameplay system, visuals and concept artwork as well as a storyline to fill that one year story gap on the GBA. Eventually I began to think that KH in 2D really was manageable, but since it was still pretty vague I came up with some systems that could adapt the KH gameplay to the GBA and asked for feedback from many members of the staff. Then I started to feel that “This can be done, can’t it?” and that is when the CoM project was really set in motion. If we glance at the project book, we can see that the backbone of KH: CoM ended up coming out of your ideas. Nomura: But all of that is written in the project book is not sufficient to make a game. All I created was the very basic concept of the game. Then by borrowing the talents and strengths of all the staff, those small ideas get bigger and bigger. Where did you get the idea of making it a sort of card game? Nomura: This is talking about KHII more but, if you were to begin the game with the very powerful Sora you had aquired at the end of KH, KHII would’nt stand up to much as a game. I wanted the players to know the potential in strength Sora has more or less fulfilled at the end of the previous installment, yet not be able to use all those abilites right from the start. That is when I thought that if I could make a story in which Sora’s abilites and memories all get mixed up, KH: CoM would be a perfect bridge between KH and KHII. I thought that to symbolise those scrambled memories and abilities, cards could be used soI had to create a card based system. Thats the jist of it, I think. Normally when you’d say “KH for GBA” we’d think of a 2D action game where Sora flings his keyblade and defeats enemies. However in, KH: CoM we see this card system, which is a new kind of fun coming out of the restrictions inherent in a card based system. Nomura: When I think of making a game system, I refer myself back to the one I created for FFV, In the latter, there were loads of abilites but only the possibility of equipping three at a time at most. Learning them all does not mean you are all powerful, then. To be efficient, you need to sacrifice some things. But it isn’t that dramatic. I believe that these restrictions are closely connected to the fun you hve in a game. In the previous installment, this was in the slight delay between the input of the action and Sora’s execution of that action, which created a little risk. This time, we aimed for a close balance between the effects of the cards and the stock techniques and the penalties they impose. Nowadays, game crews are divided into Scenario, Graphic, Sound and Programming departments but in your case, while being the Director, you can also draw, think of the game system, write the story plot and take on a variety of roles and we think that’s amazing. Looking a little more in-depth in the game: about Castle Oblivion, what world is it a part of? Nomura: In the endng scene of the previous installment, Sora runs up a path that ends up in a crossroad. It is accurate to think that Castle Oblivion is at the end of one of those paths. This isn’t explained in the egame but the building’s upper floors and underground floors, respectively, represent the Light and Darkness of memories. In the opening, there is a scene where Namine is drawing Castle Oblivion and that image overlaps with the real thing but does that mean that the Castle was created out of Namine’s drawing? Nomura: That is incorrect. Castle Oblivion is under the orders of a member of the “org”, Marluxia and Namine is taken there by them. Within the Castle, the Organization members are conducting a little research but the real meaning of the “Organization” will be explained fuly in KHII. For now, those aspects remain obscure so it is a relativeley enigmatic group. Incidently, there are 13 members in the Organization, therefor some have yet to be introduced. Nomura doesn't reveal the secret of the Organization members' names, but he hints that you'll get it in the end. How long did it take you? About the Org. members’ names, they all seem to have an ‘x’ in them when translated into english. Speaking of not understanding, the identify of the leader of the Organization is also an enigma. Nomura: “Isn’t it Ansem?” or “Isn’t it the one bandaged in red?” are just some of the theories I guess some of you have thought of. The thing is, KH2 is, even for me, unfolding in developing in such a complex way that at this stage, nothing may be pronounced with certainty. 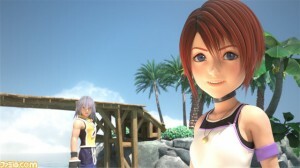 Thanks to those membrs of the “Organization”, I think KH2 will be quite an interesting and fun story. By “the one bandaged in red”, you mean DiZ? Nomura: Yes. DiZ will be one of the most important characters in the story to come and holds the answer to many questions. But, what he is thinking and what he wants is unclear to his entourage. When you learn his identity, you’ll possibly be suprised. Is there a link between the name DiZ and Disney? Nomura: It was suggested that it would be his name because a few members of the staff liked it. I also put it in because of a reason but… i’ll try to remember what that was until next time (laugh). In the newly introduced Organization members, which is your favorite? Nomura: I guess that would be Axel. He is also very popular with a majority of the other members of the staff. Given that he is further given delicious roles in KH2… Axel’s true motivations, though I cannot tell them now, is a great story in and of itself. (It’s so sad that) You could cry. The scene where he tells you what he really wants is one scene you simply cannot miss in KH2. Who is the kid in the ending? Why didn’t Sephiroth appear this time? In the ending of Riku’s story, Riku chooses neither the path of Light nor Darkness, but the road in-between. How will that choice affect him as one who wields the keyblade? 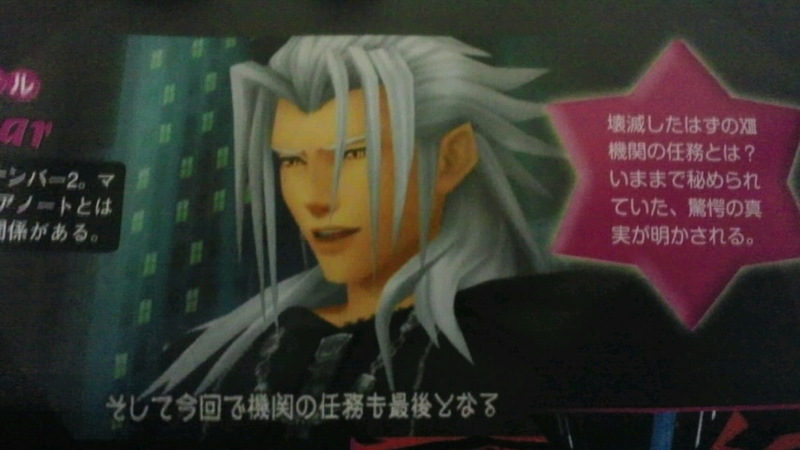 Nomura: What Riku is thinking at that point will become clear later. He decides to follow the road in-between to achieve a certain goal. Riku’s story was about “What is my relation with the Darkness?”, but some things, such as what he is, have yet to be explained. At that point, DiZ says “The road to twilight…”, but does that have a relation with Twilight Town? Nomura: Yes, it does. This will again be talked about in KH2, but… twilight, that is the time when it is neither day nor night. That theme of being in-between light and dark is central to KH2. In the previous installment, the theme was more about being of either Light or Dark, but this time we’ve added being “in the middle”. That is why there now is a Twilight Town and a Riku who follows neither Light nor Dark, but both. Twilight Town is the first world to appear in KH2, too. It is very different opening from the Destiny Islands (which was abundant with light) you begin in the previous installment on and people who played KH might say “What’s this?” and get confused. However, I plan to give that confusion further depth as the story goes on. Nomura: Yes. But, let’s just say it’s not a town that is in Sora’s own memories. It’s not that Sora has any memory of that town but… hmmmm… there is a link. It is a very important part in KH2, so it’s difficult to explain (here). At the end of Riku’s story, we see a young kid standing in Twilight Town. Who is he? Nomura: He is a new character to appear in KH2 and he holds a very important part to play, too. I will refrain from too much detail but he is to be a playable character. Besides him, many of the secret characters from the previous installment’s secret movies will appear in KH2. I plan to explain what the situations depicted in the secret movies signify. Fans were all over Roxas (at the time, known as Blonde-Haired-Kid) in his appearance in KHII. We were all wondering exactly who he was and what connection did he have with Sora? There is a KH card game that is being released. I guess you take part in that as well? Nomura: Indeed. Actually, I’ve never played a card game. I didn’t know any of the rules the card games currently released have, so I had to think of what could make the game fun myself. Then when it was decided that there would be a KH card game I wanted them to use the rules I had made up, but I realized that this was too difficult. So I decided to make it a KH card game in its own right. I was told to give up quite a few ideas while developing it. You might see that in the simplistic design the cards ended up in. There were also some cards with designs from KH2, right? Are there other fronts on which you plan to develop the KH franchise? Nomura: There are those chess pieces we revealed at the Game Show. They are considerably well done. There are many female fans for KH which is rather different from the other goodies we release. So we’re looking into developing more female-oriented products. There are plenty of ideas in that respect when it comes to KH, so please look forward to it. We have heard that in America, there is a KH being developed for the mobile phone. Nomura: There are quite a few things concerning that… Officially it has nothing to do with the original KH. It’s completely different. The title is KH, Sora makes an appearance but the story has nothing to do whatsoever with KH, CoM, and KH2 since Disney is designing it. The story is carrying on to KH2, but is there a story that will continue CoM itself? Nomura: This game system is very fun to use, so I want to use it again the future. However, CoM doesn’t really have a story in itself but, is just a piece of a much larger story. Right now, I feel that making a CoM 2 is a very difficult thing indeed. Exactly how long had Nomura the ending of KH in mind? At least by the end of KHII. Within yourself, have you been thinking far in terms of the story of the world of KH? Nomura: No, for now it’s been decided on how KH2 will end, but I really haven’t been thinking beyond that. All the enigmas that arose in KH and CoM will be solved in KH2 so it is possible to end it all then and there. However, quite a few new mysteries are glimpsed at in KH2 so it isn’t impossible to create another story afterwards. The question now is “shall it be done?”. But will KH2 feature secret movies that glimpse into a possible sequal again? Nomura: I quite like secret movies so there might something in KH2… But first, we need to finish KH2 (laughs). Aside from Kh2, you are developing quite a few other titles. Nomura: Well, apart from KH2, I’m also commited to “Compilation of FF7”, with AC (Advent Children), BC (Before Crisis), CC (Crisis Core), and DC (Dirge of Cerberus). Then there’s also Samurai Legend Musashi and another, that makes six… not counting the other projects that might being to develop soon. Nomura: It’s not exactly a burden, though. I’m surrounded by a staff that makes most things possible. After I think of the concept, the rest is cooperative between all of us. After that, the staff do a lot of the work and I’m consulted; I give the signal to go and set things back on track sometimes. We heard you once went to the emergency room while in America, but since, you’ve been working so hard, is your body’s health alright? Nomura: Quite a few people are indeed worried for my health so three years ago, I ended up going to the doctor’s. I was actually perfectly fine and people around me were “You’re not human.” and “you can do even more? !” (laughs). Finally, how do you feel now that you’ve finished CoM? Nomura: In the days following the release, I felt similarly to the way I felt after that of the previous installment. The players were first saying “Not that we’re complaining, but it is a kind of worrying title” and similar feedback rose. This is what I call a good feeling. Indeed, similarly to the previous installment, as the feedback of more and more players came to me, the popularity increased and that makes me really happy. The previous installment, for a contemporary game, has become quite a long running hit. Nomura: Indeed. But this installment isn’t exactly the concept I originally had in mind… as well as being portable, it was designed so that you could interrupt your game at any time but with CoM, but once you start, it’s hard to put down. (laugh) That is a truly happy feeling. So much data in such a small catridge which I think is for players to explore. It is all connected with KH2 so I reallly hope that fans of the previous installment will play this game. When we play CoM, we really begin to feel anxious for KH2. Nomura: KH2 is a lot faster than the previous installment but, still within limits. But, please look forward to it. We’re eager to find out what new worlds will be featured, too. Nomura: We’ve already revealed Mulan’s world, but there will also be a very suprising world. As much as The Nightmare Before Christmas’ Halloween Town was in the preview installment. You’ll probally think “What is he thinking!?”. The characters of those worlds will also be very well modelized as we have worked hard on those polygons. The more we talk about it, the more we want to playy KH2, but when exactly will it be released!? Tetsuya Nomura’s Gameography: KH, FF5,6,7,8,10,10-2, Parasite Eve, Parasite Eve 2, The Bouncer. The 13 members of The Organization, as well as having numbers, have powers attributed to each of them. Thus Axel was fire, Larxene was thunder, Lexaeus was earth, and Marluxia’s flower shaped scythe was representing his power over flowers.